The town of Litchfield is a vibrant community of approximately 9,000 people centrally located in the scenic northwest hills of Connecticut. 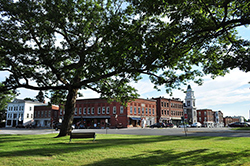 It is also the county seat of Litchfield County, which includes 26 towns and communities as far north as Salisbury and as far south as Woodbury and Roxbury. The town includes the boroughs of Bantam and Litchfield and the villages of Northfield and historic Milton. Click to easily search homes for sale in Litchfield, Litchfield condos, Litchfield luxury homes, and Litchfield land.